Home › Books › Life as the space of relationship – read here! 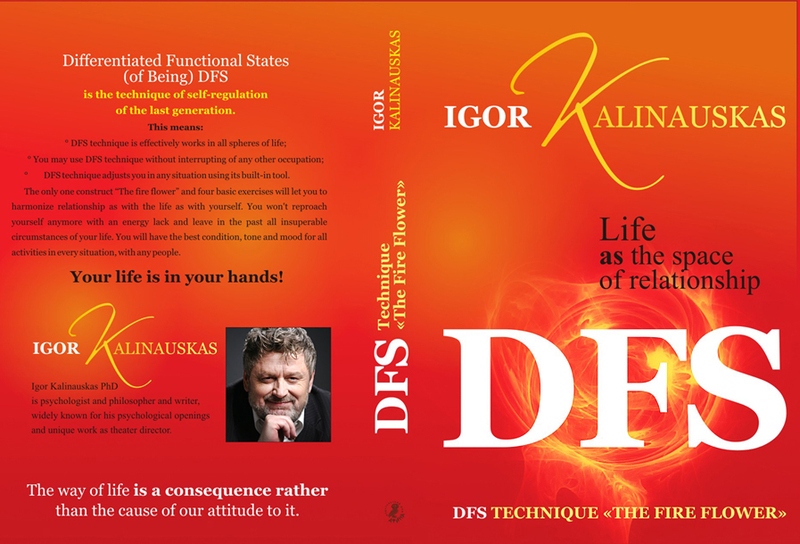 Igor Kalinauskas PhD is psychologist and philosopher and writer, widely known for his psychological openings and unique work as theater director. The way of life is a consequence rather than the cause of our attitude to it. DFS technique adjusts you in any situation using its built-in tool. The only one construct “The fire flower” and four basic exercises will let you to harmonize relationship as with the life as with yourself. You won’t reproach yourself anymore with an energy lack and leave in the past all insuperable circumstances of your life. You will have the best condition, tone and mood for all activities in every situation, with any people. – How to build a relationship, a career, a dialogue with others. Four exercises are based on the energy structure of “Fire Flower”. Sixteen states, as a palette of paints concentrated space. You want to feel like a man in the world, not a grain of sand on the shore? DFS – key you are looking for.